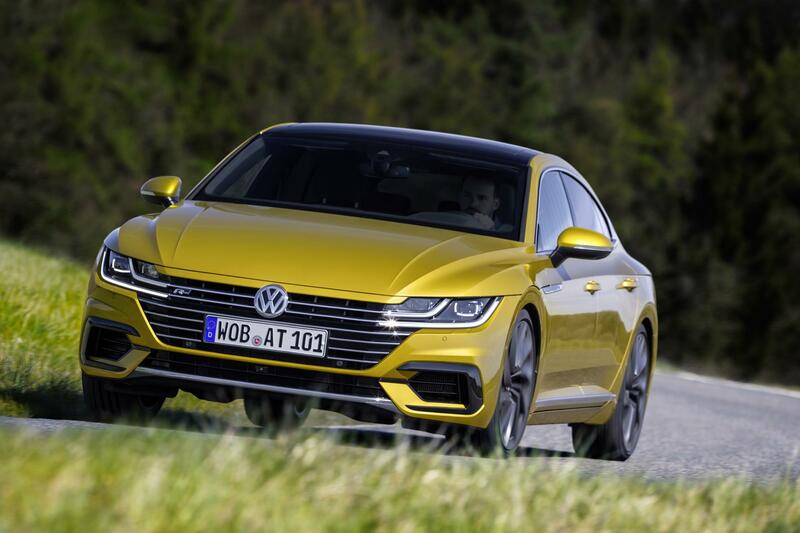 The Volkswagen Arteon is the firm’s new five door fastback flagship and it is an impressive creation. Along with state-of-the-art technology, there’s plenty to like on board including some great design ideas. The five seat creation manages to combine luxury motoring and sports car detailing with lots of space on board for the occupants. In the VW range, the Arteon sits above the hugely successful Passat but this model offers premium functionality and more autonomy. Engines for the Volkswagen Arteon, at least in the UK, feature three 2.0 litre turbocharged units; one petrol unit producing 280 PS and two diesel units producing 240 PS and 150 PS. The direct injection engines are good performers with the petrol unit featuring cylinder deactivation to boost economy. All of the engines can be coupled to either a six-speed manual box or the firm’s automatic DSG dual clutch seven speed transmission. Some models also come with VW’s 4Motion all-wheel drive system. The Volkswagen Arteon delivers excellent performance with a 0 to 62 mph sprint time of 5.4 seconds for the 2.0 litre petrol unit while the 2.0 litre turbodiesel engine producing 150 PS will return around 63 mpg. There’s also dynamic handling thanks to the flexible modular transverse matrix which delivers a platform to deliver lots of space and performance. As potential drivers should expect, the VW Arteon comes with a range of innovative and driver assistance systems – said to be the firm’s jewel in their technological crown. There are just two trim levels offered from launch with standard kit including Bluetooth connectivity, satnav and an eight-speaker sound system. There’s also the opportunity to control the infotainment with VW’s media control system using a smart phone or a tablet. Other standard kit includes a 12.3-inch screen, 18-inch alloy wheels, plush Nappa leather upholstery and electronic air conditioning. Safety equipment includes adaptive cruise control, a driver alert fatigue warning system, traffic jam assist and city emergency braking. The new Volkswagen Arteon has gone on sale with prices starting at £34,305. This entry was posted in Car Leasing, Cars, Family Car, New Cars and tagged Volkswagen Arteon by Steve Lumley. Bookmark the permalink.